This site has demonstrated an outstanding commitment to improving the image of construction, achieving exemplary standards in all areas of the Code of Considerate Practice. The visiting Monitor said of this highly impressive project: “John and Christina, along with other members of the GallifordTry team are continuing to push the boundaries to assist in improving standards, add to the comprehensive practices and procedures already in place, and to be innovative.” In this respect the contractor formed an opening in the hoarding to enable passers-by to view a tablet with a fixed set of goggles. This showed photos, artist impressions and project updates. Another imaginative idea was the introduction of a pack of playing cards for operatives displaying a variety of safety and wellbeing messages on the back of each card. With exceptional standards achieved in all aspects of this project, this highly committed team is at the forefront of industry best practice. Considerate Constructors Scheme 2018 National Site Award winners were selected from the top performing registered sites that completed in 2018. 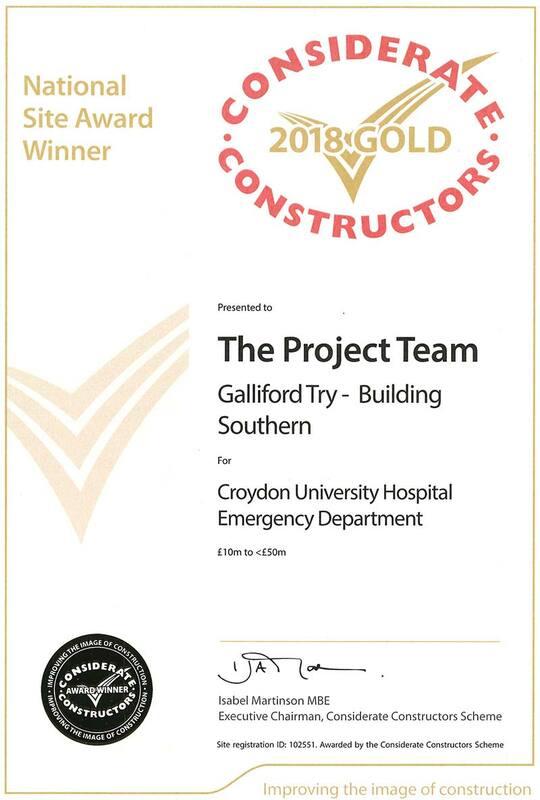 This award-winning project is a credit to Galliford Try – Building Southern and to the site team involved.